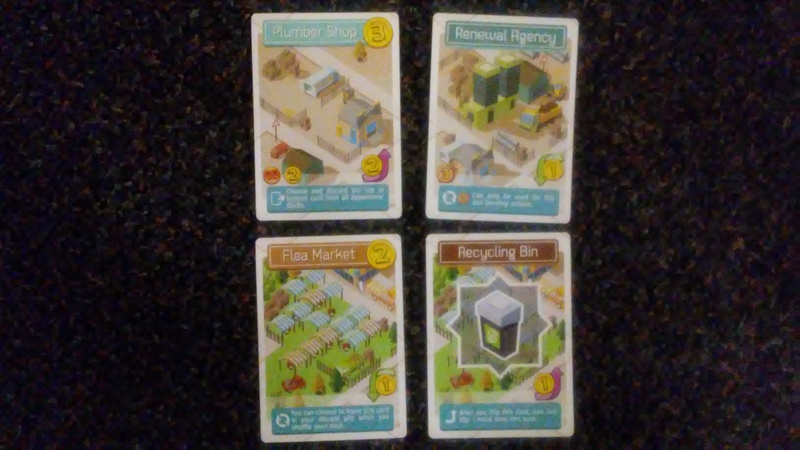 Flip City: Reuse is an expansion for Flip City by Chih-Fan Chen, published by Tasty Minstrel Games. It is for 1-4 players. This expansion adds two new types of double sided cards to be added to the game. So what does this expansion add to the game? Well as I mentioned a moment ago, it adds two new types of double sided cards. There is the Plumber Shop/Renewal Agency and the Flea Market/Recycling Bin. Each player adds a Plumber Shop and a Flea Market to their starting deck at the beginning of the game. There are then 10 cards for each set placed in two new piles along with the other cards for the supply. Everything else as far as setup, playing the game and win conditions remains the same. As I said, there are two card types. Let me explain what each one does. First there’s the Plumber Shop. This allows the player to discard a card from either the top or bottom of all the other player’s decks. When it flips, it becomes the Renewal Agency that gives the player 3 coins to be used only on the Flip cost portion of a card. Next there is the Flea Market. This can be voluntarily be left in the player’s discard pile. It can be flipped over or recycled in the discard pile to give the player an additional coin. When it flips, it becomes the Recycling Bin. This has no effect, but when it’s flip cost is paid to flip it back over it allows the player to flip an additional card that turn. Just like the base game, this expansion contains only cards. There are 14 of each of the two types for a total of 28 cards, along with the rules card. The look and feel of these cards is identical to that of the base game. The same cartoonish style of artwork is present on these as well. The quality and durability is there also and each card has that same finish. If you liked the original game, then you’ll like these too. Overall, these are some great looking cards. The rulebook for this expansion is a single double sided card. The front of the card tells you how to set up using the new card types and even has a couple of pictures on it. The back side has an explanation of what each new card does and how it works. Oh and there are pictures on the back too. Overall it’s a pretty simple concept that gets the job done in a very minimalistic way. I like it. If you enjoyed the original Flip City, then chances are that you’ll like this too. What this expansion does it just gives you more cards to add to your deck and a few more options to take. Much like what the Office cards do for the base game, this just adds more content. There’s nothing majorly game changing or anything like that. However the Plumber Shop does add a bit more player interaction. The rest of the cards just give more money and more ways to get cards flipped. For me this is a little more icing on the cake. It just adds a bit more flavor and things to enjoy. Is it necessary or needed? Well no not really but I like what it adds. Like I said, if you’re a fan of the original game, then you’ll most likely want to add this to your collection. I would recommend it. 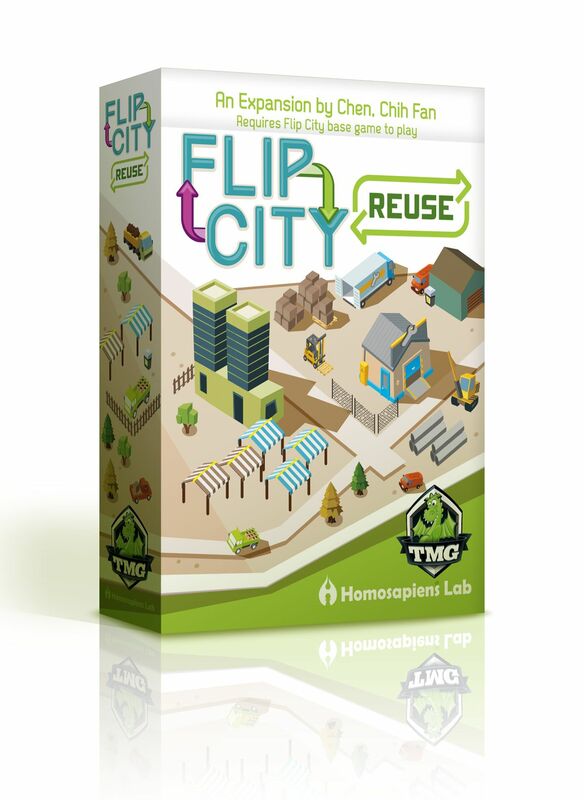 Flip City: Reuse is an expansion for Flip City that adds two new double sided card types to an already great game. The expansion doesn’t really add any additional play time to the game. Most game sessions last around 35-40 minutes. The artwork on the cards is much like that of the original game. The same cartoon like style is prevalent here as well. The expansion does add a bit more player interaction to the game. Fans of Flip City should really enjoy the expansion. It adds more content without changing the dynamics too much. I wouldn’t say it’s a must buy but it will be one that players will enjoy having. I would recommend this expansion. Now flip the lights. This entry was posted in Reviews and tagged board, board games, card, card games, chih, chih fan, Chih-Fan Chen, city, flip, flip city, games, minstrel, reuse, tasty, tasty minstrel games. Bookmark the permalink.